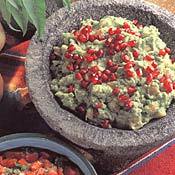 RECIPE TITLE "Guacamole Guanajuatense Recipe"
In this recipe devised by Claudia Alfaro de Petriccioli, fruits and vegetables are combined with the avocado, and the pomegranate seeds add a touch of color. This recipe, from La Cocina Regional de Mexico published by the Bancomer Volunteer group, has been translated with the kind permission of Maria Eugenia R. E. de Guajardo. Put the avocados and garlic in a glass bowl and mash with a fork. Add the remaining ingredients except the pomegranate seeds and mix well. Add more salt to taste, and garnish with the pomegranate seeds. Use the guacamole to stuff roasted, peeled green chiles or serve with pieces of chicharron (pork crackling) or tortillas.